There wasnt anything to like. It was filthy and noisy as hell all night. The drunken cleaners very very noisily started mopping and sweeping at 4am it was ridiculous the banging coming through ceiling and walls i actually told them both to shut up to no avail. One was sweeping soapy mop water straight from the balcony up stairs down onto the level i was on. I recommend you dont go here if you intend on getting a sleep. Also the room stunk and most rooms at $99 a night usually would have a bar fridge not this one just 2 dirty old fans no air conditioning. The place needs to be gutted and refurbished with sound proof walls and floors! By far the seediest and noisiest place i ever stayed and ive been in jail before! The room wasnt worth $25 a night. Ripped off and sleepless. Location couldn’t be any better. The hostel itself was very large and there were lots of open common areas. Rooftop area was awesome. Free surfboard rentals was a plus as well. Nice place overall, felt like there were quite a few people living here for extended periods of time. Seemed pretty cliquey. It feels like a family:) Boiling water always ready, free coffee, big kitchen and fridge, tons of places to hang out, great place to meet people, job agency in the building, beach within 5min walk. Central location. Towels provided and changed daily. Staff friendly. Superb location, super friendly staff, with a chilled surf culture vibe. Friendly staff! Fantastic location with everything in walking distance. The room had all the basics including bath towels, basic toiletries and tea/coffee facilities. Great view from the balcony! Loved Arya the cat! 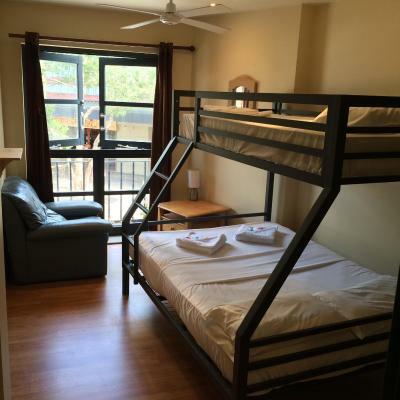 Boardrider Backpackers and Budget Motel This rating is a reflection of how the property compares to the industry standard when it comes to price, facilities and services available. It's based on a self-evaluation by the property. Use this rating to help choose your stay! 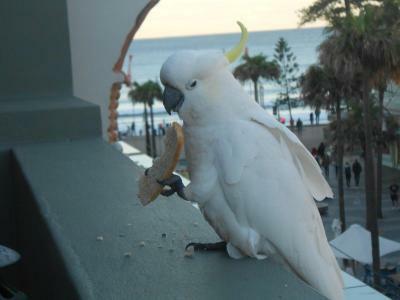 Located just 250 feet from Manly Beach, Boardriders offers budget accommodations aimed at young guests. It offers free WiFi, free continental breakfast, free snorkeling, sporting equipment and surf board rental. The rooftop terrace has a bring your own alcohol tiki bar and 360-degree views of Manly. Guests can relax in the games room with PlayStation3, table tennis and board games. There is also nightly entertainment. Facilities include laundry facilities and shared kitchen with dining area. 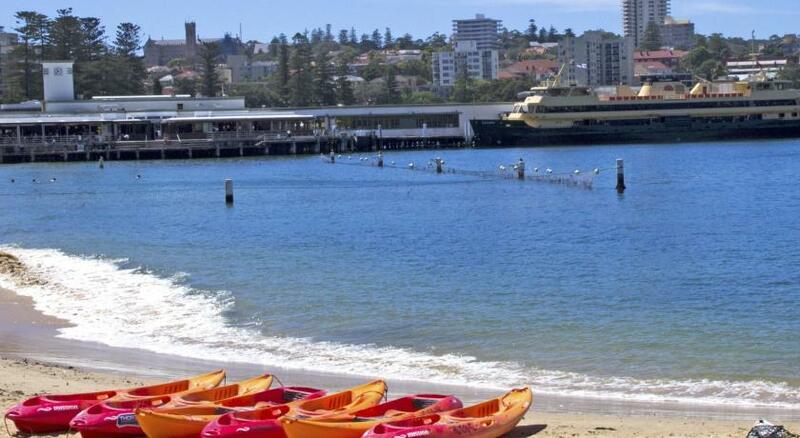 Boardrider Backpackers and Budget Motel Manly is a 5-minute walk from Manly Wharf, where you can catch the iconinc ferry to Sydney Harbor to Circular Quay and Sydney's famous Opera House. 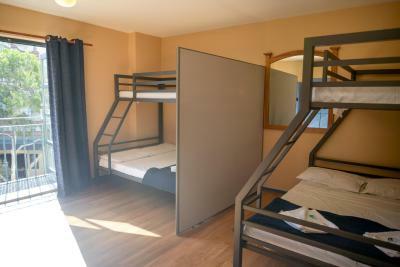 All rooms are equipped with fans and large secure lockers. Private rooms have a TV, tea/coffee making facilities and fresh towels. Some rooms have private bathrooms. 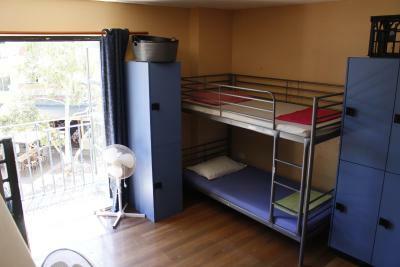 When would you like to stay at Boardrider Backpackers and Budget Motel? Features tea/coffee making facilities, TV with DVD player, and access to shared bathroom facilities. Please note there is no capacity for additional guests in this room. Guests have access to electrical power sockets, large secure lockers and shared bathroom facilities. This room offers tea/coffee making facilities, a private bathroom and water views. House Rules Boardrider Backpackers and Budget Motel takes special requests – add in the next step! Boardrider Backpackers and Budget Motel accepts these cards and reserves the right to temporarily hold an amount prior to arrival. Please inform Boardrider Backpackers and Budget Motel of your expected arrival time in advance. You can use the Special Requests box when booking, or contact the property directly using the contact details in your confirmation. Wouldn’t recommend to anyone over 25 or families. Very noisy both inside and outside the building. Sounded like someone was constantly moving furniture directly above. The balcony doors didn’t close/ lock properly so this probably didn’t help with outside noise. Earplugs provided, but unfortunately had little affect. Dust on furniture and TV. Cobwebs on walls and ceilings. Hairs in bathroom. Splash marks on TV. Basically needed a thorough clean! Seemed expensive considering poor cleanliness. I booked a private room, it said water views, there was no water view. the ceiling fan was hanging by a thread (or so it seemed as it wobbled all over the place, it was noisy and was covered in dust). the shower curtain was too short so the water went everywhere in the bathroom. the bedspread was stained. A bath mat would have been helpful! Dorms have a lot of "permanent residents" who take up a lot of room with a lot of gear, making them very crowded. Dorm door usually remained propped open, so security questionable. Female dorms will have males barging in to see their mates, not ideal when you're changing !! Kitchen had a fair bit of broken equipment. Clean in regards to domestos, dirty in regards to junk in dorms ! Location, staff, great showers, good price, common areas comfy. Rooms were a little tight and hot but the beds were nice. The kitchen was pretty dirty most the time, some bugs crawling around as well. Hostel very dirty and some forniture were destroyed. It would have been better to sleep inside the car!!! The staff tried to help us to do the check out earlier.